Iran on Saturday slammed new US sanctions against 10 of its citizens and an Iranian company over their alleged involvement in a massive state-sponsored hacking and intellectual property theft scheme. The US Treasury Department unveiled charges on Friday against nine Iranians along with sanctions against 10 individuals and the Mabna Institute, which it accused of hacking hundreds of universities on behalf of Iran's Revolutionary Guards. Foreign ministry spokesman Bahram Ghassemi called the accusations "false". "Iran condemns the United States' provocative, illegal and unjustified actions, which are a major new sign of the hostility and animosity of US leaders towards the Iranian people," he said in a statement on the ministry's website. "They will not prevent the scientific development of the Iranian people." The two founders of the Mabna Institute, Gholamreza Rafatnejad, 38, and Ehsan Mohammadi, 37, were among the nine Iranians indicted in New York and whose assets are subject to US seizure. Since 2013, the Mabna Institute carried out cyber intrusions into the computer systems of 144 US universities, the Treasury Department said, and 176 universities in 21 foreign countries. Mabna Institute employees and contractors "engaged in the theft of valuable intellectual property and data from hundreds of US and third-country universities... for private financial gain," it said. "For many of these intrusions, the defendants acted at the behest of the Iranian government and, specifically, the Iranian Revolutionary Guard Corps," Deputy Attorney General Rod Rosenstein said. The US Department of Labour, the US Federal Energy Regulatory Commission, dozens of private firms and non-governmental organisations such as the United Nations Children's Fund were also allegedly targeted. 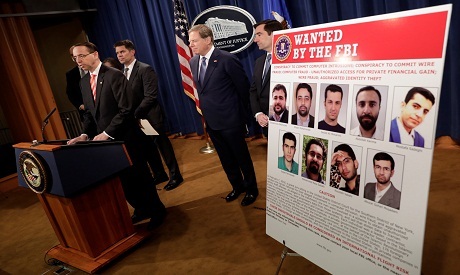 Geoffrey Berman, US Attorney for the Southern District of New York, said the Iranians conducted "spearphishing" attacks designed to steal passwords from email accounts in what he called one of the largest state-sponsored hacking schemes ever uncovered. Since taking office in January 2017, US President Donald Trump has adopted a tough stance against Iran and repeatedly denounced a landmark deal that Tehran reached with world powers to curb its nuclear programme. Trump said in January that the 2015 deal must be "fixed" by May 12 or the United States will walk away.